Some of the most interesting images at the City of Richmond Archives come from donations of family photograph collections. Family photographs are often thought to be of little interest to anyone outside of the family involved, but nothing could be further from the truth. Three girls take a swim at Whiterock in 1913 in this image donated by the Thompson Family. City of Richmond Archives photograph 1985 39 287. Family photograph collections may show locations of interest and significance, portray activities of historical value and add social context to Richmond’s history. Irine McDonald is shown here in a duck punt on the still waters of the North Arm in 1924 in this McDonald Family photo. The Celtic Cannery can be seen in the background. City of Richmond Archives photograph 2013 47 4 5. 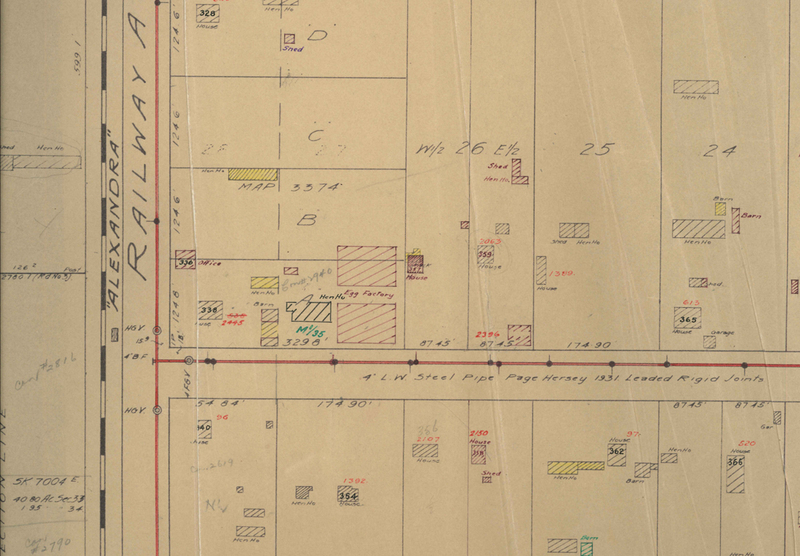 The City of Richmond Archives is the official repository for the inactive public and private records of enduring and historic value to the City of Richmond and the community as a whole. 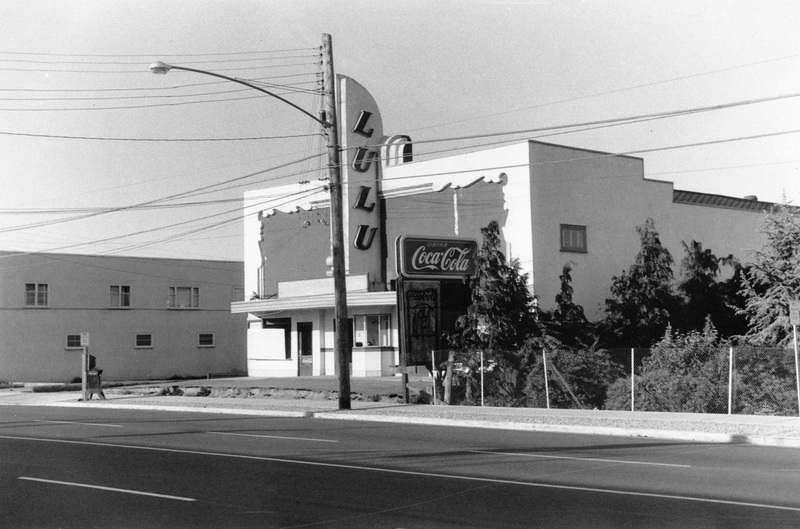 This image of Richmond Photo is one of many donated to the Archives by the family of Noel McConnell, a well known and prolific Richmond photographer who worked out of this building. He took countless photographs in Richmond, from aerial photos to wedding, sports and school photos to pictures of life around the area. Much of his work is now preserved at the Archives. City of Richmond Archives photograph 2012 2 a. 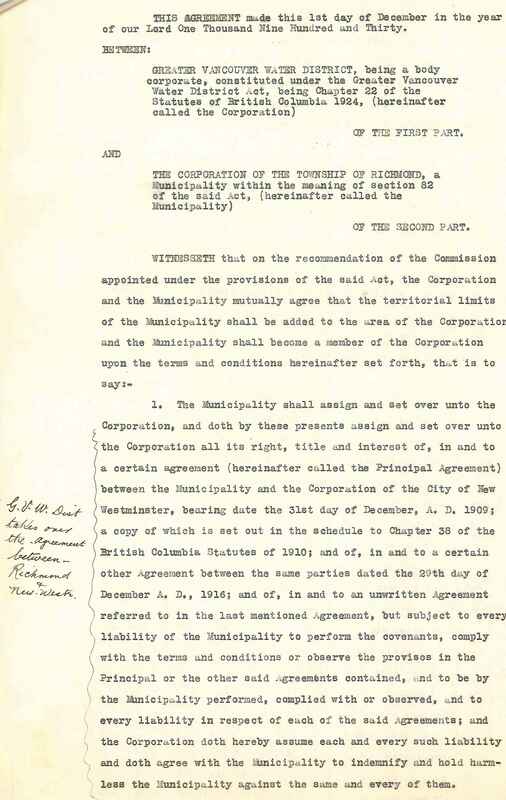 It is the work of the City of Richmond Archives to preserve and protect these records and to make them accessible to City officials and the public, as set out in Corporate Records Management Program Bylaw 7400. This image, donated to the Archives by the Russell Family, shows winning horse “Fair Ruffles” and jockey Wells at Lansdowne Park on June 21, 1952. Also shown are trainer Jackie Russell, Phyllis Russell, Barry Blair, Archie Blair and Roberta (Blair) Diamond. City of Richmond Archives photograph 1998 29 16. 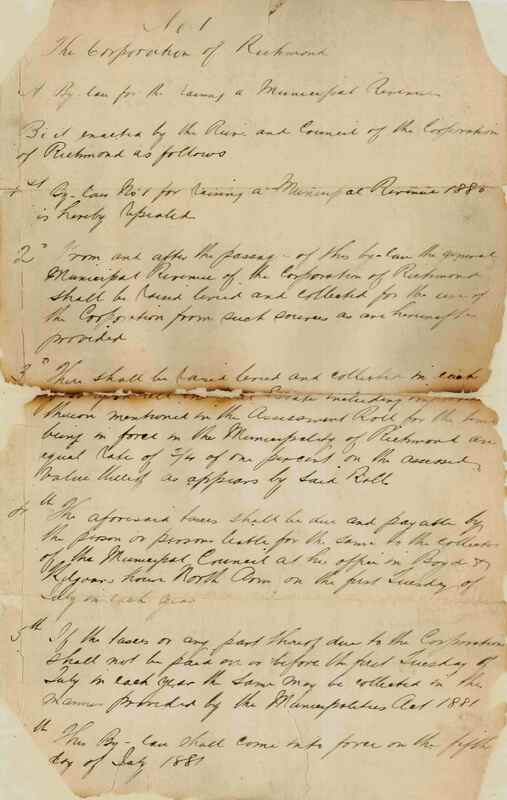 The Archives acquires both public and private records by scheduled transfer, gift, bequest, purchase, exchange or any other action by which title to the material passes to the Archives, with the understanding that ownership is held in trust for future generations. This photograph of young couple walking their dog near Garden City Road between Saunders and Francis Roads, ca. 1958, is a good example of a family photo that has been donated to the Archives. City of Richmond Archives photograph 1985 5 7. Significant photos may come from any time period, right up to the present. If you have any photographs that relate to Richmond and you are not sure what to do with them, please do not throw them away! A farmer raises his hat while sitting on a haystack in this photo. City of Richmond Archives photograph 1978 35 13. Donating your original family photographs to the Archives ensures their long-term preservation and accessibility by you and your family members for generations to come. Contact the Archivist by telephone at 604-247-8305 or by email at archives@richmond.ca to determine if they might become part of the Archives’ collection. As part of the City of Richmond Archives’ ongoing digitization program, Archives volunteer Graham Turnbull has digitized 3,621 colour slides from the City of Richmond’s Production and Mapping Centre. Archives volunteer Graham Turnbull is shown here digitizing photographs using a new scanner purchased by the Friends of the Richmond Archives in 2015. The Production and Mapping Centre, Planning and Development photographs were the first photographs to be digitized using the new scanner. Richmond Archives photograph. The slides date from 1981–1995 and were taken by Production Centre staff. The photographs record natural features of Richmond along with buildings, subdivisions, community events, farming and industrial activities. An aerial view looking south-west over the intersection of Westminster Highway and No.3 Road, the Park Towers and Minoru Park. City of Richmond Archives photograph 2008 39 5 61. These photographs were used in various Richmond municipal publications and in public presentations of the Planning Department. The slides document a time of changing landscape in Richmond’s history. Woodward’s Store at Lansdowne Mall, 1982. City of Richmond Archives photograph 2008 39 2 70. Bridgepoint Market children’s play area, 1990. City of Richmond Archives photograph 2008 39 2 202. To view these images, either the original slides or digitized copies, researchers are welcome to make an appointment to visit the Archives. These images will also be described and made available online when the Archives Database and Web Search Upgrade project is launched in 2016. Working on a helicopter at the BCIT Aerospace Technology Campus. City of Richmond Archives photograph 2008 39 1 148. Loading seafood for export into an aircaft container. City of Richmond Archives photograph 2008 39 3 235. Municipal governments in BC have the authority to tax property owners to pay for the costs of governance and local services. 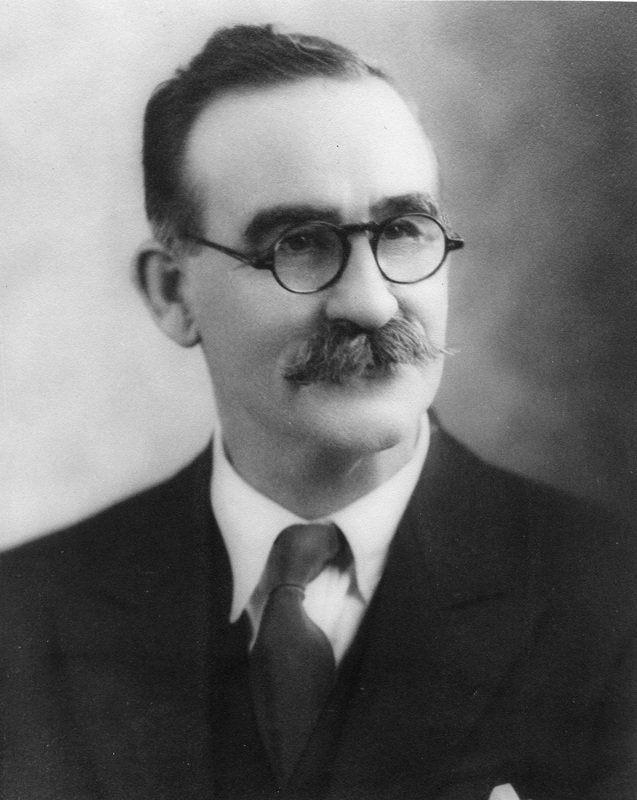 The City of Richmond Archives holds records of these activities carried out in Richmond dating back to the earliest years of the municipality. These include property assessment and the preparation of assessment and local improvement tax rolls, the collection of taxes, tax sales, and the hearing of taxpayer appeals. 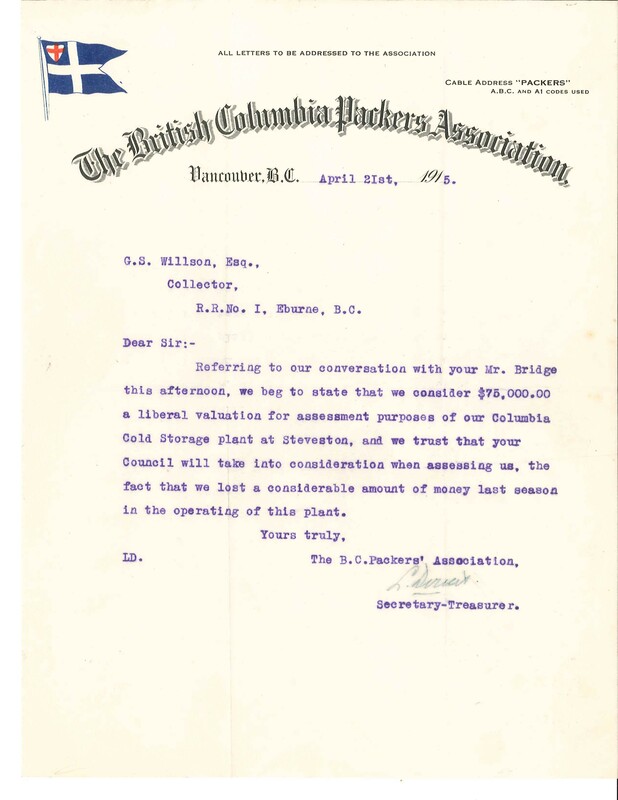 The municipality was responsible for tax assessments until 1974 when the BC Assessment Authority was established. Tax assessment and collection rolls dating from 1905 are available on microfilm for research at the Archives. From 1896 to1974 a Court of Revision for assessments sat to hear appeals from property owners. The Archives holds original minutes of these meetings. 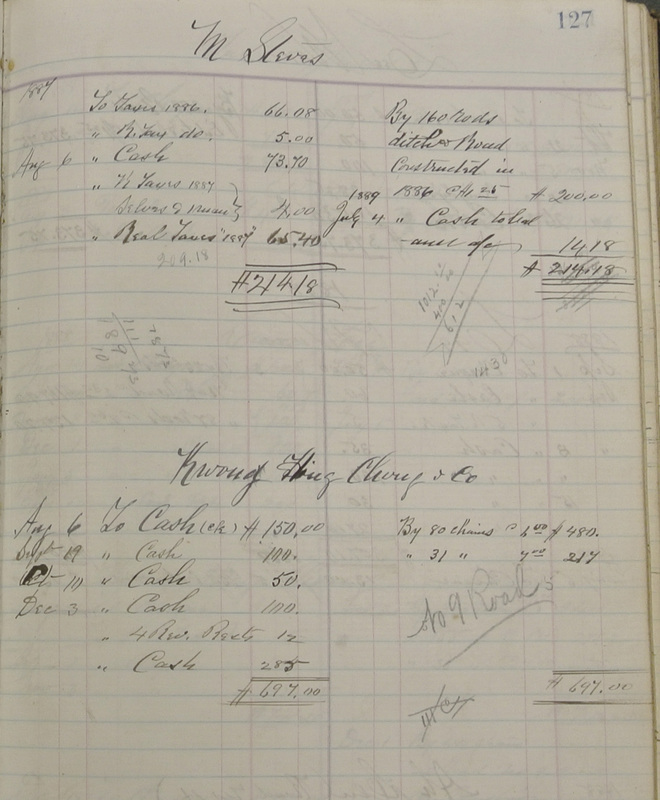 Other records relating to taxation in the Archives’ holdings include early ledgers recording the collection of taxes and delinquencies, early Clerk’s Department correspondence files, files relating to tax sales and taxation policy, and photographs of buildings taken by the municipal Assessor. Since 1961 when the Historical and Museum Advisory Committee was formed, Richmond’s municipal government has been involved in identifying and preserving heritage sites in the community. 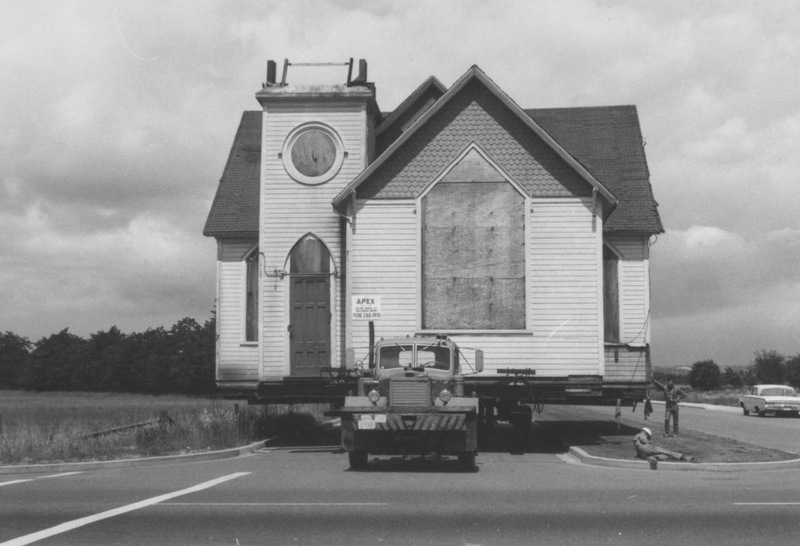 One of the first major heritage projects undertaken was in 1967, when the original Richmond United/Methodist Church building at the corner of River Road and Cambie was purchased by the municipality, moved to Minoru Park and renamed Minoru Chapel. 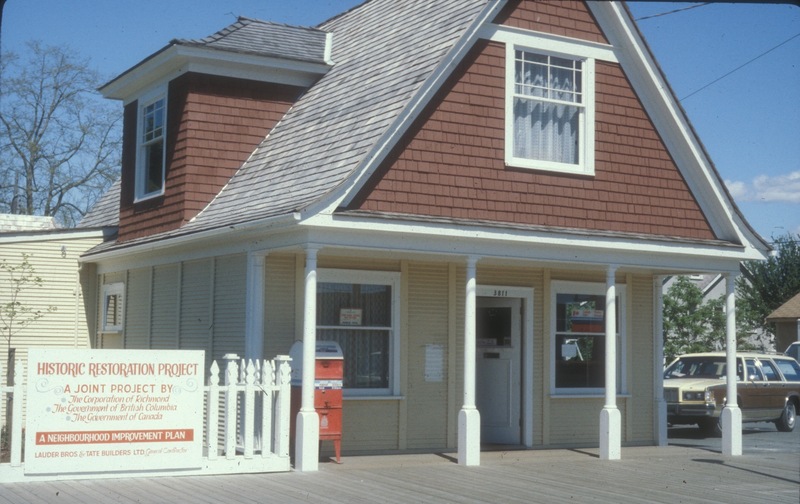 The acquisition and restoration of heritage buildings by the municipality continued in the 1970s and 1980s, with the Royal Bank (originally Northern Bank) in Steveston, London Farm, and the Britannia Shipyard being the most notable during this time. Other important heritage preservation activities included the establishment of the Steveston Heritage Conservation Area and the development and preservation of Garry Point Park and Scotch Pond. 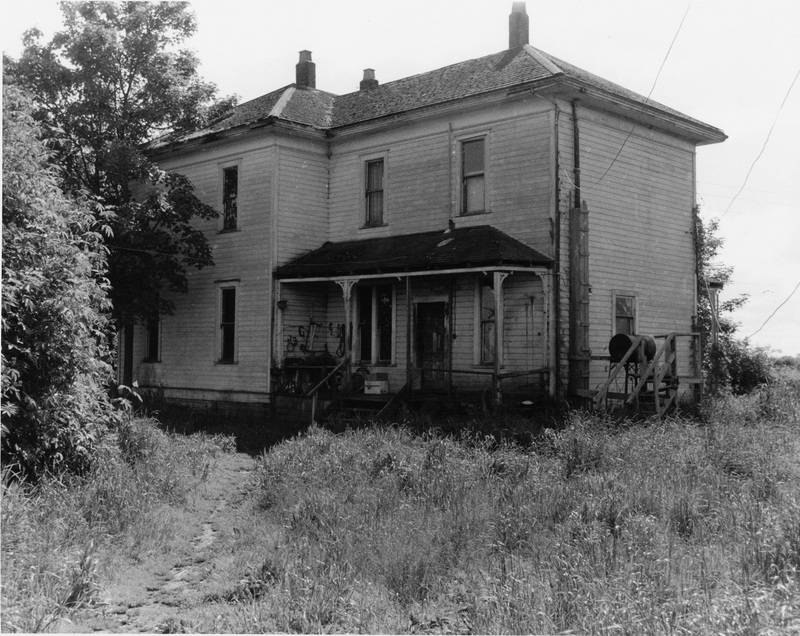 The establishment of a Heritage Advisory Committee by the municipality in 1984 marked the beginning of a formalized program for heritage preservation. That committee, later reconstituted as the Richmond Heritage Commission, conducted a number of important heritage studies, not the least of which was a formal Heritage Inventory for Richmond. The first inventory was published in 1984 and several updates have been made since. 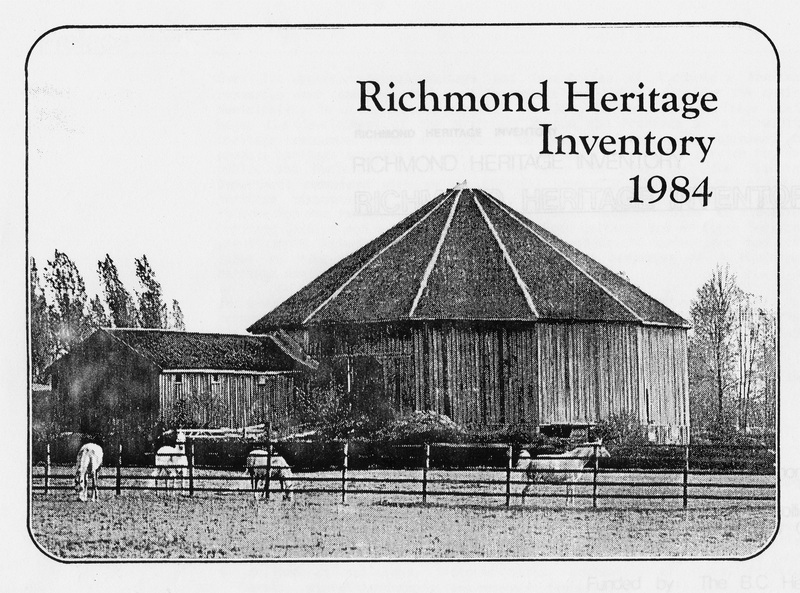 The City of Richmond Archives has comprehensive records documenting heritage preservation activities in the community, dating back to the records of the Historical and Museum Advisory Committee and including minutes, research files, project files, studies and reports of the Heritage Advisory Committee/Heritage Commission. In addition, records of the Engineering Department and the Leisure Services Department document restoration, maintenance and programming activities at municipally-owned heritage sites. Records of the Planning Department, Law Department and Clerk’s Office provide an accurate picture of the process by which heritage properties were acquired, and how policies relating to non-City owned property of heritage significance have developed.